Banana Nut Protein Smoothie Recipe – Nutrishop Tampa Nutrishop Tampa is a great place to get supplements and vitamins, order by telephone 813-991-9999 today! At Nutrishop we want you to know that our supplements are not only healthy but are very versatile. We don’t want you to feel like you just have to choke down the same warm water protein mixed beverage. In this article we will give you a super quick recipe to make a delicious Banana Nut Protein Smoothie Recipe. Not too complicated, just a few ingredients many healthy people already have in their home. Combine all these ingredients into a blender and then blend them together until smooth, not liquid frappe. Feeling like you need insane amounts of protein? Add a second scoop of protein to get close to 70 grams of protein goodness. 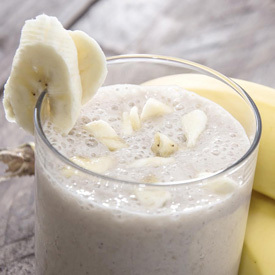 This Banana Nut Protein Smoothie Recipe is a super easy way to boost your caloric and protein intake, or substitute a meal with this satisfying and delicious smoothie drink. Running low on ForzaPro Peanut Butter Banana? Call Nutrishop Tampa at 813-991-9999 today to get your hands on one of the most flavorful proteins on the market.